The iTranslate Voice for iPhone, iPod Touch, and iPad successfully integrates voice recognition software to help you communicate in other languages quickly and easily. iTranslate Voice is a problem-solver iOS application with very specific capabilities. Its simplicity in navigation and function is shocking when you consider the task of translating conversations. With the settings icon, you select the language you will speak and the language for translation. 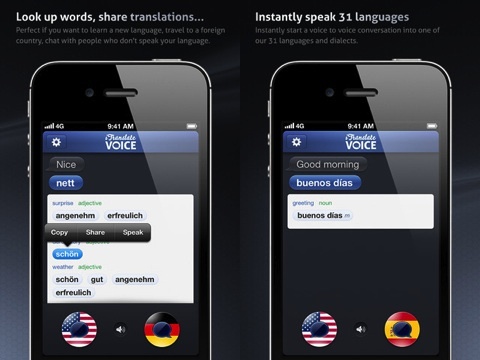 Currently, there are 31 languages accommodated by the iTranslate Voice iPhone app. You press the microphone with the correct country icon, and you speak. It automatically shuts off at the appropriate pause. A conversation bubble with your words appears at the top of the screen. 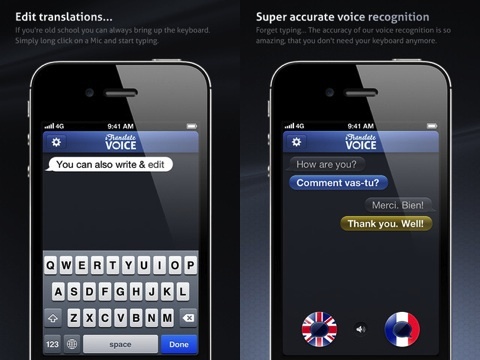 Then, the iTranslate Voice iPhone app produces the translation, and a voice reads the translation. You can press the conversation bubble, and you can choose to copy, share, or speak the translation. You can text, email, or Tweet directly from the iTranslate Voice iPhone app with a touch. You can also copy and paste to use in a document. The iTranslate Voice iOS app also incorporates dictionary functionality using its extremely accurate voice recognition software. You state a word, and the word’s part of speech and definitions appear. This is an extremely helpful tool to quickly find and communicate the appropriate word in a pinch when travelling or in business conversations. The iTranslate Voice iOS app’s voice recognition functions very well, and the navigation and capabilities are easy, agile, and intuitive. The iTranslate Voice iPhone, iPod Touch, and iPad app is a great value, as well, for anyone who needs quick access to other languages. AppSafari review of iTranslate Voice was written by Jenni Ward on June 27th, 2012 and categorized under App Store, Productivity, Reference, Travel. Page viewed 5840 times, 1 so far today. Need help on using these apps? Please read the Help Page.